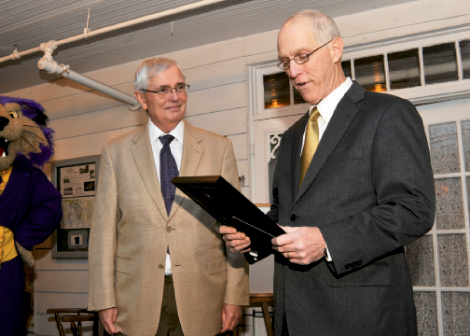 Mayor Mike Fitzgerald (right) presents Chancellor Bardo with a declaration of appreciation for the school’s support during Destination Dillsboro, an event that brought 250 students and faculty to the town to shop and explore. 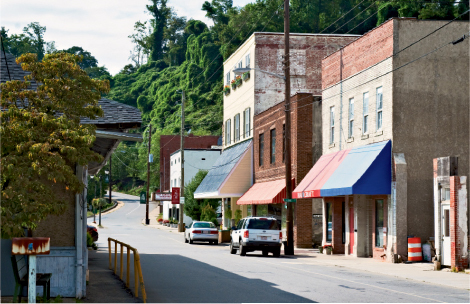 Recent economic woes have impacted every Western North Carolina community, but one town took a double whammy in 2008. When the Great Smoky Mountains Railroad limited trips to Dillsboro and closed its ticket booth there, the tiny town (population about 250) lost a key source of tourist traffic. Now a unique initiative is helping resuscitate the town. In late 2009, Western Carolina University Chancellor John Bardo announced that the school would launch a partnership with Dillsboro. Since then, Western has deployed dozens of professors and scores of students to help the town, explains Betty Farmer, a professor of communication and public relations who serves as Bardo’s special assistant for the project. “Our goal is to share the expertise and services that we have at Western with Dillsboro merchants, and help them address the economic downturn,” she says. So far, students and faculty in disciplines ranging from public relations and business to art and hospitality/tourism have pitched in, developing a comprehensive rebranding strategy for the town, conducting merchant and visitor surveys, producing radio and video promotions, drafting press kits, and offering guidance on new marketing plans. By the end of last semester, Farmer estimates Western had contributed more than 3,000 volunteer hours. Farmer stresses that, however much Dillsboro gains from the project, the students have been beneficiaries, too. Ashley Funderburk, a junior public relations major from Lincolnton, assisted with a social media training workshop for business owners. “A great thing about social media programs like Facebook and Twitter is they give you the chance to reach new audiences, and make them aware of what’s going on in Dillsboro,” she says. The project has been a highlight of Funderburk’s higher education. “It’s one thing to learn about all of this in our classes, but in Dillsboro we’re getting real-world experience,” she says. Spruce Pine is unique in that it essentially has two “main streets.” Locust Avenue (shown) is referred to as Lower and Oak Street is called Upper. It’s no secret that Spruce Pine has seen more than its fair share of hardships, particularly the outsourcing of mining, textile, and furniture manufacturing jobs. The woes increased in August 2007, when The Mineral City became victim to arson fires that destroyed buildings and businesses, with losses in the millions. As is often the case with tragedies, the fires became the impetus for change. Town officials recognized it was crucial to get people shopping, eating, and playing downtown again, explains Bryan Freeborn, Main Street Spruce Pine’s new executive director. On top of a welcoming climate offered by the city, a recent change in the alcohol laws opened new avenues for entrepreneurs, including Jennifer Rambo and Chad Mohr, owners of The Pizza Shop & Dry County Brewing Company. 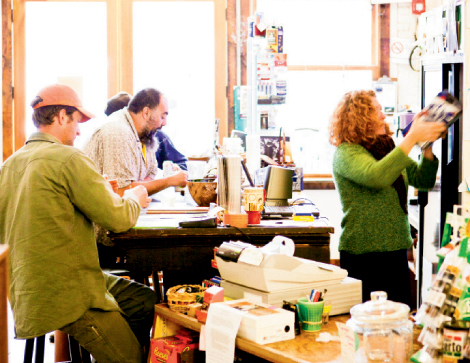 The artist couple moved from Penland in 2010 to take over the pizza shop, and added the brewery. “Spruce Pine is moving forward. It hasn’t stalled and it’s not going backwards again at this point,” says Rambo. Wendy Gardner, a native of Burnsville, and her husband, Nathan Allen, are also involved in the renaissance. Moving from Los Angeles, the couple took a chance and opened Knife & Fork in a downtown space that had seen eateries come and go. “People used to say, ‘You have a restaurant where?’” says Chef Allen. 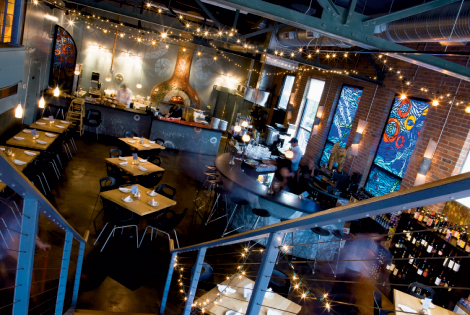 Almost two years in, the restaurant has earned a reputation for excellent cuisine and its support of local farmers. Still, businesses that sell necessities are almost absent. With moves being made to get closure on the burned buildings that still sit vacant, Freeborn sees a great opportunity for entrepreneurs to get deals on prime shop space. “We need a clothing store, a shoe store, another coffee shop and deli,” Freeborn says. West First Wood-Fired Pizza specializes in gourmet pies. 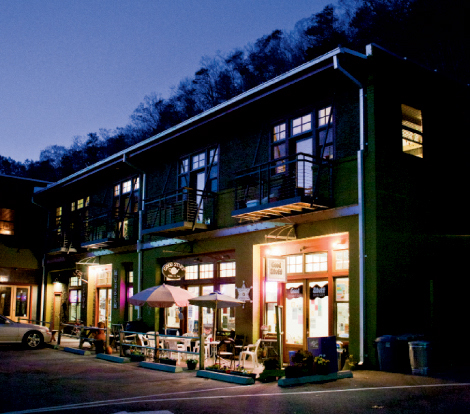 If you’re hungry in Hendersonville but uncertain what you’re hankering for, just stroll down a stretch of Main Street. Fine Italian fare? Try Mezzaluna. Eclectic tapas plates? Never Blue’s got you covered. Or how about a to-die-for veggie burger? Square 1 Bistro awaits. A dozen or so other options are mere steps away, and one need only turn a corner or two to find Thai food, sushi, wood-fired pizza, and other delectables. The town’s core was already strong thanks to revitalization efforts that began in the early ’90s. But Hendersonville’s stock as a culinary center has risen more recently, notes Laura Huff, a local foodie who’s blogged about it all, first at Hendersonville-Epicurean.com and now at her recently renamed CarolinaEpicurean.com. She started the site three years ago, using it to review and spotlight what she saw as notable (but too often overlooked) eateries. “I wanted to create a buzz about what was happening in Hendersonville because it seemed so unique,” Huff explains. And she found plenty to promote. “In the first year I was blogging, 18 new restaurants opened in the downtown core area,” she remembers. She branched out into profiles of local farmers and chefs, highlighting their collaborations, and launched a biannual series of small-plate crawls (think two days of sample plates around town). Hendersonville diners can expect even more out of the food scene, as the roster of pubs and restaurants continues to grow. Recently, there’s been a string of new arrivals, including Appalachian Brewery and The Blue Note Grill and Flat Rock Wine Shoppe. The ingredients for the town’s gustatory gains have deep local roots, Huff and others say. Many of the downtown restaurants stock their pantries with locally grown food and serve bread from area bakeries, thus putting more money back into the community. What’s more, there’s a strong independent streak downtown, with locally owned stand-alones vastly outnumbering chain establishments. Drexel Town Manager Matt Settlemyer was instrumental in creating the town’s business incubator. Well before the most recent downturn, Drexel already had slipped into economic doldrums when the once vibrant furniture industry shut down. As the quiet community became even quieter, town officials pursued economic development opportunities to revitalize the local market. 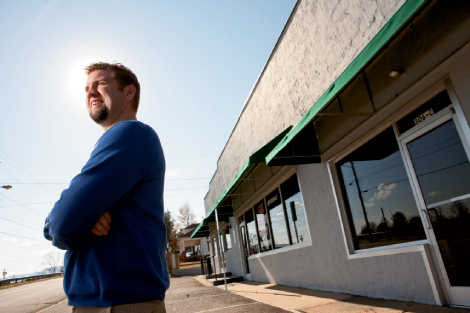 In an innovative effort to prompt entrepreneurial activity, the town in 2007 purchased a vacant 6,000-square-foot downtown building and, in partnership with Western Piedmont Community College, established a small-business incubator. The town undertook renovations on the building, which contained three spots for enterprises. To help start-ups get off the ground, the program offers below-market rents with a limit of to three years in the space. The incubator currently has two tenants—a tile and flooring company and a commercial photography studio. The town hopes to have the third space filled early this year. Adding further momentum to the effort is a $100,000 Golden Leaf Foundation grant that was awarded in mid-2010, with some of the funds going toward further renovations. Amy Gillespie opened Good Stuff Grocery, which is part grocery store, part tea house, and part performance space. Ten years ago, you’d have been hard-pressed to find anyone in downtown Marshall who wasn’t mailing a letter, getting their car registration renewed, or grabbing some tools at one of the two hardware stores. It was a ghost town lined with empty storefronts. Today, that’s quietly changing, one small business at a time. Interest in the town had practically vanished decades ago after a highway construction project rerouted Madison County traffic away from Marshall, taking almost all commerce with it. But a strange thing happened at Marshall’s main intersection in 2002. Joel Friedman, a transplant from Atlanta, opened Zuma Coffee shop, the town’s first eatery in a long time. His logic in taking such a risk was simple: Marshall was a blank canvas and it needed a place where people could socialize. As life slowly returned, Pulleyn transformed the former high school building into artist studios and a community center—saving it from almost certain demolition. Creative professionals from across the county set up shop in the old classrooms at Madison High Studios. 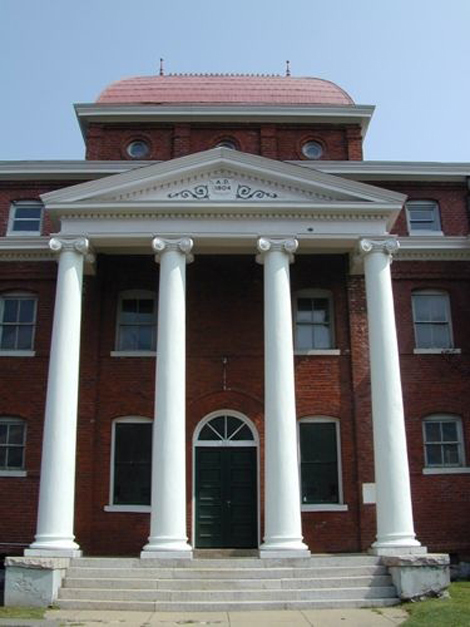 In the following years, an old church was bought and converted into a performance space and theater, many buildings have been refurbished, a couple of restaurants opened, and other businesses have taken root. What’s so remarkable is that the projects have mostly been undertaken on small budgets—offset by long hours put in by business owners and supporters. Unlike other small WNC towns that rely on tourism to bring in money, many Marshall businesses are working to earn a local dollar. And the fact that the town’s hardest years remain a close memory has imbued residents and business owners with a sense that they need to work together. And it’s for that reason, that every resident and business owner feels like they own a piece of the town’s rejuvenation. The Jackson County Courthouse (left) is undergoing renovations to house the main library. Courthouses, stately and grand, have long symbolized the strength of a town. But as these historic structures became ill-suited for the modern legal system, many were left vacant. Today, more and more cities are reinvisioning their roles as centerpieces of the community. 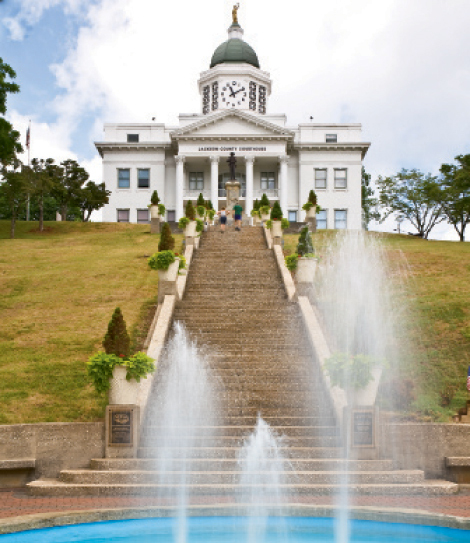 Built in 1913 and vacated in 1999, Sylva’s historic courthouse is slated to be reborn this spring. 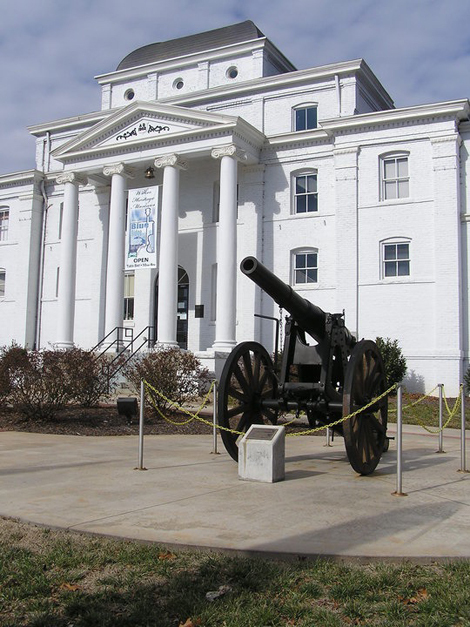 Known as the most photographed courthouse in the state, the renovated facility will host a public library more than four times the size of the current Sylva branch, provide community meeting spaces, and become a home for groups including Jackson County’s arts council, historical association, and genealogical society. Learn more about the project at www.fojcml.org/new-library.html.